Why do Sinners Choose to Obey the Word of the Lord? Hooray for Saint Hilda’s House. It’s truly a blessing to live and to learn with others, especially to witness the dynamic range of Christian interpretations and the various approaches to life and faith. Yes, I make a relative distinction between life and faith, with life meaning the realities of what we experience and faith being hope. Both these of concepts encompass our relationship with God, but life is a struggle. Back in January, I sat down with the Saint Hilda’s House residents and asked them how they wanted to spend the next six months together. I expected a list of activities: hosting dinners, going camping, visiting New York City, etc.…. Instead, they said they wanted to keep developing new ways to serve together as a community. Of course, they are each already serving in their non-profit worksites and doing wonderful things, but there is something more they want to share together. The experience they desire is one of serving as part of something bigger. To use the words of St. Hilda herself, they want to serve as part of a community bound together by a commitment to evangelical peace. 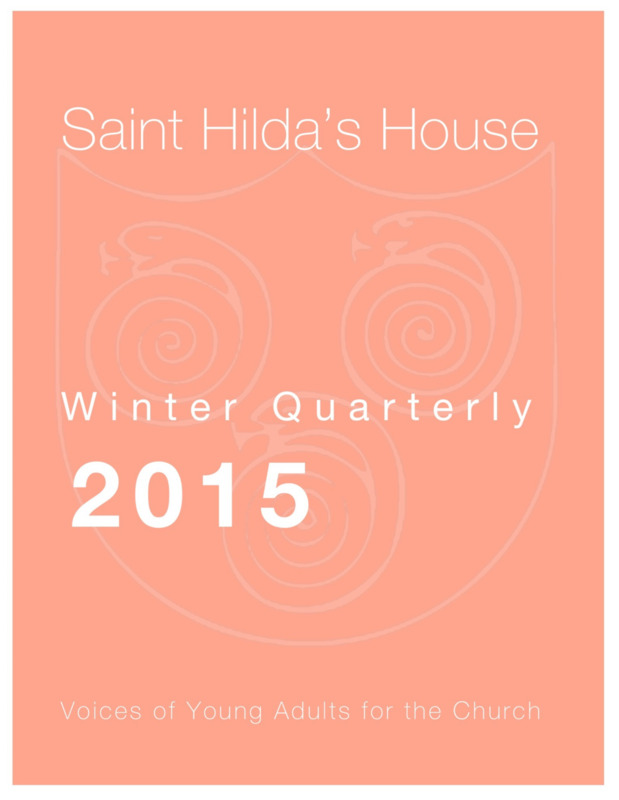 For more of Shancia's writing, check out the St. Hilda's House Winter Quarterly. Serving the community: what on earth does that mean!?!? I guess it’s the commitment that we Hildans make to be conduits for those in need; conduits of the services of Christ and His Church. Whether we can be these conduits, though, is only proven in our ability to walk for Christ. This walk for Christ, as I call it, literally means an active process of human mobility. Every week, Monday to Thursday, I walk to CareWays, a homeless shelter for women and children, in order to serve as both an administrative assistant and a motivational figure. I obviously want to encourage the women with the Truths of the Gospels, but I’m also conscious that calling directly upon the Name of Jesus can be a problematic thing to do, for many reasons. Nevertheless, through personal prayers and house meetings, I seek to utilize one of the fundamental pillars of Christianity in my work at CareWays: love. In addition to honoring God, Christ remained us that we must love our neighbors for it is right to do. Even when they drink our milk, steal our parking spots, and ignore our morning greetings. We must strive to love them unconditionally, with a love which can only be found in the mercy and compassion of Our Lord (after all: God is Love). I love these women, I see Christ in their testimonies. At times, others tell me to be cautious and distance myself from the needs of the women. Professionalism, however, is not counter to compassion: I affirm that I take a professional tone at all times, even as I speak about love. Most importantly, I refrain from being a verifier: I allow the Holy Spirit, to do its job! Instead, I pray for wisdom and grace to serve the needs of the women. If I assumed a role of verifier or enabler, then I myself will be a judger of the brethren and that I am not (for it is written that Jesus Christ alone is the judge of men (2 Timothy 4)). The fact remains, however, that these women are homeless, and love is their last resort. With my heart, I desire for these women to commune with each other in grace and peace, for I know that they have already received a beating from this world and those in it. Their testimonies remind me of my unmerited favor in Christ to have a supportive family, a fruitful internship with Christ Church, and an active relationship with God. I pray that they knew how much I care and love them. Daily, I pray for their increase in strength, joy, prosperity, health, faith, and love as God moves in their lives (and I would ask that anyone reading this prays for them too). For I believe that He is there, even (especially) in our hardships. He will never forsake us, for we are His. Born of His breath and formed in His image, we belong to the Lord. It feels wonderful to know that we belong to the Almighty. When I draw into these intimate moments of reflection, especially as I witness the power of God in the lives of others, it brings me to tears of joy. Yes: we must find joy in the lives of the homeless, those stricken with poverty. For in their fears of financial instability, God makes a way. It may not be what we envision such as the immediate needs of providing housing and monetary provisions. All the same, God gives us compassion, faith, and strength to love; God gave me compassion, faith, and strength to love. Faithfully, then, I try to serve these women in that love by being an accommodating but challenging motivator. Below is a piece of prose inspired by the women of CareWays. During a house meeting, I asked the women to reflect on their contributions to this world. None of their contributions could be defined in monetary provisions and other material needs; but this didn’t mean that they hadn’t contributed anything. This moment begins with me. Life is about me: my relationships and my reflections. Every day, I witness the present world and envision the great things in which I contribute to this world. For I am a person, a friend, a dreamer, a believer, a worker, and a mother living in this very space. In this space, I share me with you today, my feelings and my ambitions. Henceforth, let this moment only begin with me. By knowing me, I discovered that motivation and empowerment derives from me, my willingness to believe and to live in the power of my dreams. In the midst of my fears, I possess power. The power of life- that compassionate power to make a change, a difference to live in and for the Greater LOVE within me…. So today and every day, I smile and send my love to all those who witness me. I rejoice in this very day. This prose is posted on the all CareWays bulletins and recited at each house meeting. I must admit I read it to myself at times for encouragement. We will begin a writing club, once a month. This is just one way I hope the women of CareWays will be able to see how much they have to give to the world. You can support CareWays here. Throughout this year, young adults have been writing pieces for the St. Hilda's House blog. The St. Hilda's Winter Quarterly is a collection of ten of those pieces, dealing with the questions which have most challenged our writers over the past three months. Leaving aside my own writings, I believe that they demonstrate how engaged, how passionate, and how informed the young adults of the Church today are. I believe they serve as powerful examples of how young adults can speak to and for that Church. All of the pieces in this Quarterly have been written by people who either live or have lived in intentional community, serving with the disinherited as members of the Episcopal Service Corps. Megan, Will, Shancia, and I are current members of St. Hilda's House, whilst Jordan Trumble was a member of St. Hilda's for its first two years. Rosemary Haynes, meanwhile, is a member of Deaconess Anne House in Missouri. Our writings focus on the issues which this form of life confronts us with: poverty, racism, misogyny, what it means to live a Christian life, what it means to be a member of the Church. Despite this diversity of topics, however, each of these ten pieces has one thing in common: they all hold Jesus Christ at the centre of their testimony. Whether it is Christ encountered in the Eucharist, Christ encountered on the street, Christ encountered in the Bible, or Christ encountered in the neighbour we find it hard to love, all of our writers point to him as the decisive factor. In this, these writings continue the theme of Father Robert Hendrickson's book 'Yearning', which gave young adults a platform from which they can describe how they have been formed by their encounters with God. And if this Quarterly does nothing else, I hope that it demonstrates, beyond a shadow of a doubt, that there are young adults who are dedicated towards learning what it means to walk in love as Christ loved us. The Winter Quarterly is divided into two sections. The first section deals with concrete issues of formation and service. Jordan writes about how her experiences living in the tabernacle and the slum shaped who she was in relation to God, whilst Will delivers a powerful reflection on how Christ can test us on the streets. Rosemary writes about her first-hand experience of protesting on the streets of Ferguson after the killing of Michael Brown, whilst Shancia describes how racial prejudice in the presentation of Dr. Martin Luther King Jr. prompted her to explore the theological underpinnings of his actions. Finally, I have written about how my relationship with Scripture was changed by moving from Oxford to New Haven, then on why we shouldn't talk about Church as if it's first and foremost something that we go to. The second section focuses on more general debate, and features four longer posts by Megan and I (possibly because we're two of the more opinionated and verbose Hildans...). Two of these posts attempt to work out particular approaches to questions of religion and spirituality. The other two ask whether or not the Church of England should have consecrated the Traditionalist Bishop Philip North a week after the consecration of Bishop Libby Lane. Though these pieces are less explicitly focused on the nuts and bolts of living in community, the reflections contained within them were shaped and developed within community. In my mind, they show how important the life of intentional Christian community can be when it comes to informing general theological reflection. It is an absolute honour to be able to make this collection of writings available for the wider public. We don't have the full resources to do a full print run, so I hope this digital publication suffices for now. I apologise for how many of the pieces are mine: I hope this is less to do with self-indulgence, more to do with the fact that my job as Digital Missioner requires that I write about 2/5s of our posts anyway. Whichever way, I cannot commend highly enough the writings of my fellow authors, and I hope they prove as spiritually enriching for you as they have for me. Download the Quarterly here: http://www.sainthildashouse.org/quarterly. If you would be interested in receiving a print edition, please email us as sthildas@christchurchnh.org. If you want to read more from St. Hilda's House. then you can visit our blog at www.sainthildashouse.org/blog, join our mailing list, or like us on Facebook. The blog updates on Mondays and Thursdays. You can also support the ministry of St. Hilda's House at www.sainthildashouse.org/donate.